The CCRSS undertakes researches in symbolic systems and processes of social communication among communities with a low social and cultural status in India. Its cultural studies presently pertain to three fields of immense and immemorial oral cultural patrimonies in India: women's folk songs, social history of subordinated communities and popular oral mythical narratives. The objectives of the projects are similar: methodic collection of data, classification and archiving (see a cultural-sociological database), structural content analysis with interpretation involving the informants (see Unfettered Voices), write-ups and publications, seminars and eventually practical valorization. The aims are identical: reveal ways and forms of cultural agency characteristic of the subordinated. 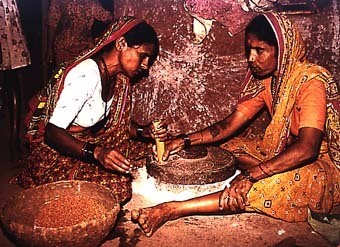 All over the Indian sub-continent, peasant womenfolk for centuries did compose and sing poetic verses while grinding on their stonemill the flour of the day. We todate collected more than fifty thousand of such distichs (see songs at the grindmill). That exclusively feminine and oral tradition is to be preserved, first, on account of its significant anthropological imports. Moreover, the potentialities of that creative memory are to be carried over: they indeed testify to an autonomous capacity of articulation of one's insight into one's own past within the context of a patriarchal dispensation (see Sita's exile). That rich matrimony further offers a valid basis for a reflexive and critical construction of a renewed identity in present times. This is a case in point regarding a fruitful interface of tradition and modernity, and the status of folk forms as vehicles of social cultural communication (see Street drama and the musicological-anthropological analysis of singing at the grindmill). 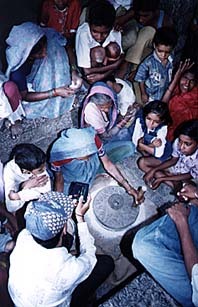 Youth from traditionally repressed communities or down-trodden groups who have the social vision, the will and the elementary skills to that effect are assisted to observe, note down, record and write extensively the past and present history of their community as narrated by the elders, the women and the youth from their own community. The rationale behind this attempt is that subordinated communities should be able through some of their own representatives to articulate their own vision of the past and build up a collective memory of their own. The initiative, the authority and the skill to hold a discourse on lower social sections should not be left to established intelligentsia from socio-culturally hegemonic classes. This task is one naturally to be taken up by young social actors from within those repressed communities themselves. A number of oral myths circulate among tribal and marginalized communities in India. They enshrine the world view of the latter. These cultural traditions can not be disposed off as exotic, esoteric or primitive fables. They incorporate relevant, human and deep insights. They authoritatively deal with fundamental issues such as gender, social status, discrimination, power, salvation, identity, violence, etc. Still they speak a language as strange as a code to be deciphered. A methodological key is required to enable us to read and interpret those popular myths. Our research starts with analytical and structural deconstruction of the narratives after the manner of Claude Levi-Strauss, and then proceeds with hermeneutical reappropriation understood as interpretative self-understanding after the manner of Paul Ricoeur. This type of hermeneutics is construed as a strategy to establish an efficient interaction between the cognitive symbolic forms embedded in ancient oral myths and our modern anthropological categories or cognitive structures.